Winter Weddings are becoming more and more prevalent as more and more couples think outside of the box to not only save on money, but to make it easier on friends and family through the busy summers. We found one such place in Buffalo that offers a great mix of location, beauty, closeness and fun. That place is Diamond Hawk Golf Course. We picked Diamond Hawk as the best of winter weddings in Buffalo for several different reasons. Location — Diamond Hawk is ideal for winter weddings because it is beautiful, having the perfect mix of nature no matter what the weather. Proximity — Weddings in general, regardless of being summer or winter, are difficult for many friends and family to get to. Diamond Hawk is very close to the airport and major highways. It’s amazing, you’re in a country setting that is almost walk able from the airport. 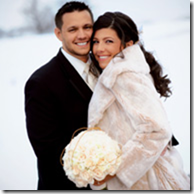 Beauty — Rain, sun or snow are all possibilities in Buffalo for any winter wedding. Regardless, Diamond Hawk looks gorgeous in any light unlike most urban areas with dirty snow banks and slush piles. Also, deer have been known to come right up to the windows from time to time. Price — Affordability is key in summer weddings and winter weddings. Nobody wants to start their “Happily Ever After” in debt. Diamond Hawk has special winter wedding rates that will leave you enough money to start you on the right track together. January 18, 2013 in Best in Buffalo. Wow – who wants to get married in the winter in Buffalo? Winter is tough enough, let alone planning a wedding. Ha, in all seriousness, good article though.